Microsoft demonstrated myriad updates for Windows Azure, finally making the platform competitive with AWS in the IaaS market and pleasing developers. Durable Windows and Linux virtual machines (WAVMs) from portable *.vhd images, which you can download and run on-premises without modification, deliver long-awaited IaaS features without cloud lock-in. Data-Disks you attach to WAVMs and then mount and format as drives enable specifying optional geo-replication support to direct Windows Azure Backup to continuously replicate data for backup to a secondary data center at least 400 miles from your primary data center. Figure 1. 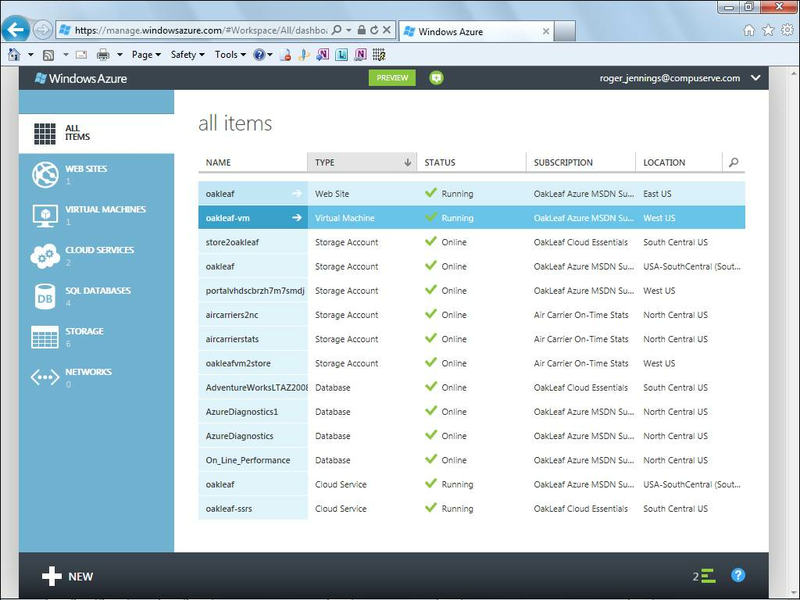 The HTML 5 Windows Azure Management Portal. Up to 10 free shared Windows Azure Web Sites (WAWSs) per subscription with a gallery of open source content management systems can bring Windows Azure to cost-constrained users. Windows Azure Active Directory (WAzAD) and virtual networks and enable cross-premises connectivity for enterprise-grade hybrid clouds. An HTML 5 management portal with built-in monitoring features enables tablet and smartphone devices, as well as PCs, to shepherd WAVMs, cloud services and storage (see Figure 1). REST management APIs with Powershell for Windows and downloadable BASH for Mac and Unix tools make it easier to automate administrative operations. Windows Azure SDK 1.7 installs side-by-side with v1.6 and provides tooling support for Visual Studio 2010 and 2012 RC; users can select which SDK to use when creating a new project. A distributed cache feature provides a low-latency, elastic cache to which you can allocate a percentage of your cloud service’s memory (called colocation) or add memory from new cache worker roles, devoted solely to caching. A new Windows Azure SDK for Python supports Python, Django, and IPython Notebook with Windows, Mac and Linux installers to broaden the development and device spectrum. A tenfold reduction in transaction charges, now $0.10 per million, reduces the cost of Windows Azure storage. New locally redundant storage (LRS) provides a 23% to 34% discount over the cost of geo-redundant storage for users who are willing to sacrifice recovery from a single data center wipeout. The release of SQL Reporting, formerly SQL Azure Reporting Services, means users will incur charges of $0.88 per hour for up to 200 reports per hour starting on August 1. Windows Azure Media Services, presently in the public preview stage, enables building workflows for creation, management and distribution of media. WAVM users can select a Linux OS from a gallery offering OpenLogic CentOS 6.2, SUSE Enterprise Server, openSUSE 12.1 and Ubuntu Server 12.04 LTS (Figure 2). WAWSs offer the choice of Acquia Drupal 7, DasBlog, DotNetNuke Community or Professional Edition, Drupal Commerce Kickstart, Joomla! 2.5, mojoPortal, Orchard CMS, Umbraco CMS 5 or WordPress CMS and e-commerce apps, as well as ClearDB’s MySQL distribution. Source code for Windows Azure SDKs and client libraries is published under an Apache 2 license and maintained in Git repositories. You can deploy apps to Web Sites with FTP, Git, TFS and Web Deploy. Figure 2. 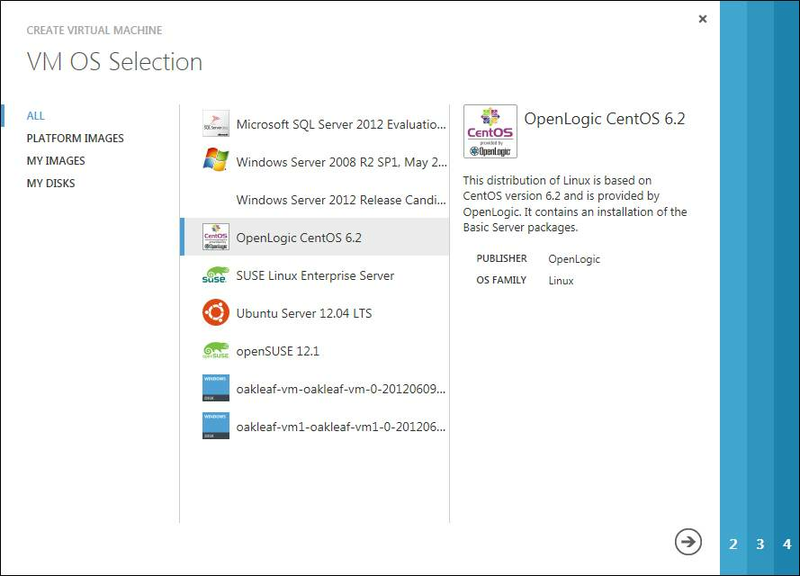 Step 1 in the Create Virtual Machine process offers more Linux than Windows server options. The remaining three steps configure and deploy the VM. Cramming all these new features into a single mega-release, instead of taking Amazon Web Services’ approach of doling them out weekly, can cause information overload. Scott Guthrie promises future Windows Azure upgrades and updates won’t be of “Spring Wave” magnitude, but will occur in smaller, more frequent doses. In the meantime, Windows Azure now stands in good stead to head off competition from recent Infrastructure as a Service entrants, such as IBM, HP and Oracle. Below is a list providing substantial links to “Spring Wave” articles and demos by the Windows Azure team, Windows Azure and BizTalk MVPs and Microsoft execs. Magnus Mårtensson’s explains why Windows Azure Takes The Lead… in his blog post. Wade Wegner, CTO of Aditi Technologies shares his thoughts on the Windows Azure announcements. The Windows Azure team shares Windows Azure SDK for Python from the Python Developer Center. Bill Staples discusses how Windows Azure Sites are the Web infrastructure of the future at Tech•Ed 2012. The Windows Azure storage team introduces locally redundant storage for Windows Azure Storage and highlights price reductions for storage transactions. Azure deployment methods can benefit your enterprise - learn how today.